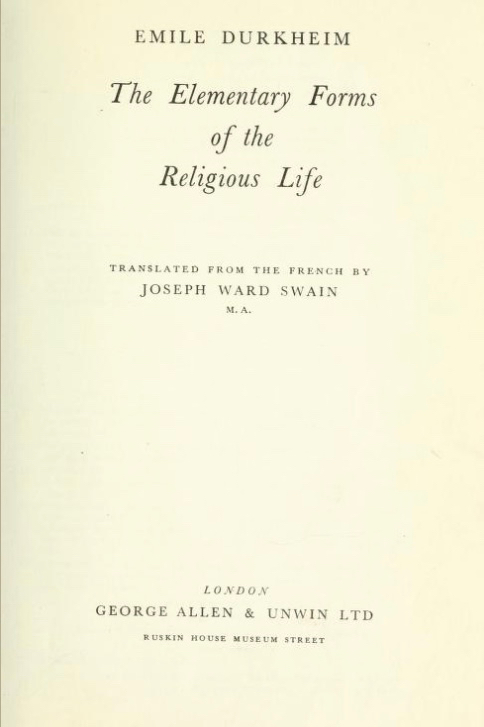 A chart from a page of Emilé Durkheim's The Elementary Forms of Religious Life (1912, originally published in French as Les formes élémentaires de la vie religieuse). Durkheim (d. 1917), mentioned by Snook, was a founding sociologist. Karl E. H. Seigfried published a three-part interview on Norsemyth.org with sociologist Jennifer Snook (formerly University of Mississippi, now Grinnell College) focused on matters relating to her recent book, American Heathens: The Politics of Identity in a Pagan Religious Movement (July 2015). Notably, while also an academic, Snook is herself a Heathen, and the interview focuses on both her research on Heathenry and her personal experiences as a Heathen in the United States. KS – There is a ritual element to your academic work. In 2003, you made an oath at a blót [Heathen ritual] that you “would honor the time that others had sacrificed to help me by publishing my work.” Throughout the book, you refer to “our faith,” “our strengths,” “our weaknesses,” and so on. How do you think this open identification as a believer in the minority faith tradition you write about will impact reaction from the wider academic community? JS – There’s a conversation going on in Pagan Studies circles right now about how insider-scholars who write about their own groups are too apologetic and not critical enough of their own experiences and observations. And certainly this has been a problem with some insiders, or anthropologists “going native” in the field, losing their ability to be “objective” about their subject. But there’s also a push for more critical analysis of gender, race, privilege, and other aspects of society – studying “up” to the elite, rather than simply focusing on the disadvantaged. My training and the influences from which I draw inspiration are in this critical tradition. I think that scholars who read my work will have the common language of this critical perspective and understand that my insider status gave me insights that outsiders may not have had, but that the work is ultimately a critical examination highlighting both the subjectivities of Heathens, but also the context in which they practice. An illustration of a historical Hammer of Thor, worn as a pendant by North Germanic pagans during the Viking Age. Image via Wikimedia Commons. Iceland Magazine has published an article on Germanic Neopaganism (also widely known as Heathenry): "Heathenry in Iceland, America and Germany: The mainstream and the fringe". Focused on Germanic Neopaganism in Iceland, Germany, and North America, the brief article primarily examines responses to the Ásatrúarfélagið's decision to conduct gay marriage ceremonies (which we previously reported on here). The article is authored by Karl E. H. Seigfried, who runs "The Norse Mythology Blog", a blog focused on Germanic paganism and topics such as J. R. R. Tolkien and Richard Wagner.